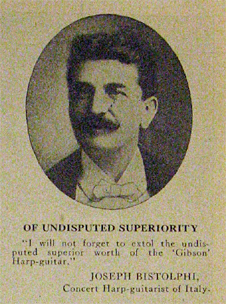 I’m speaking of course of Orville Gibson…and the rarest of the rare: harp guitars he designed and built before the Gibson Company was even a figment of anyone’s imagination. What do we know? Extremely little. There is just one surviving Orville harp guitar known – but it is a doozy! It’s his outrageous floor-standing model, tucked away in the dark recesses of Gibson Company headquarters. It looks almost like a tabletop model until one considers its size, which is huge. At the moment, we have no documented specs on it, but I did run across a web photo one time that showed it in someone’s hands and it looked about the size of the large early Gibson Co. Style U harp guitars. Its scale is presumed “standard” while the length of the twelve sub-basses can be inferred from there. The fact that they’re severely offset – creating more of a “zither-guitar” visual – confuses the eye a bit! Asking Walter Carter about its size and the c.1900 date listed in his book with George Gruhn, he revealed that he considers this instrument’s “1898 patent” label as suspect, looking more like an over-sized copy than a legitimate Orville label. He promises more measurement details for us if he ever gets another look at it. Though there’s no direct evidence, we’re virtually certain that Orville designed and built the original harp guitars (and all the instruments) shown in the first Gibson Company catalog woodcuts (below). After the Company formed in October, 1902, there’s simply no way a new factory could have been up and running in time for new instruments to have been built and illustrated for a catalog that was assembled and mailed out “about the first” of February, 1903. 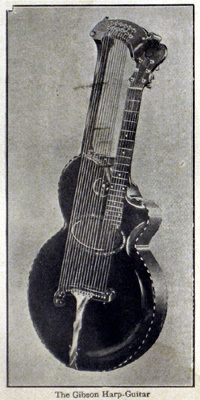 No surviving specimen of the 1903 Catalog Style U has ever surfaced – only two historical photographs that show it: this single undated photograph (below, courtesy of Michael Wright) and Gibson’s ad from the April, 1903 Cadenza. Interestingly, the earliest known surviving Gibson Company instrument – #2502 (below) – is a harp guitar that has Orville’s patented construction: the solid, one-piece rim and the back/neck heel shapes. He very well may have built this instrument single-handedly; if nothing else he undoubtedly supervised it. This is where we stood until just recently, when an intriguing batch of newspapers clippings from the Kalamazoo Gazette and Kalamazoo Daily Telegraph came to light, discovered by colleague Paul Fox (thanks again, Paul!). 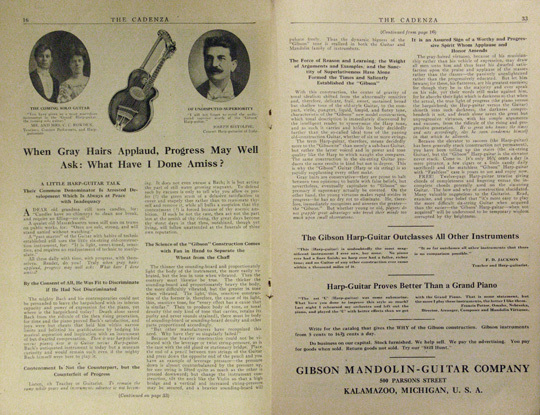 They highlight several random moments of harp guitar activity in Orville’s pre-Gibson Co. career and confirm that Orville did in fact design and build multiple harp guitars. What these looked like is unfortunately not known. Following are the five (so far) notices and my thoughts. Four years before the creation of the Gibson Mandolin & Guitar Manufacturing Co., we have this first record of Orville building a harp guitar, a “12-string” so obviously one with six sub-basses. It may have been a duplicate of the eventual 1903 Style R shown above, or something completely wild. It was undoubtedly a chunky, carved top instrument, and yet it won in competition against a 12-bass Harwood, a 6-bass Washburn and a 6-bass Bohmann, all large flat-top guitars and all known for their good to fantastic tone. In what way it was “superior” in the sole judge’s opinion (“foremost guitar expert” Leo. B. Moore) is not mentioned (nor have I found any information about our “expert”). It would certainly help if we knew what kind of a player Moore was – surely this wasn’t just a visual comparison? – and which instruments were strung in gut, steel or silk & steel. Note the “retail value” figures of the three, and surprising omission of Gibson’s price. 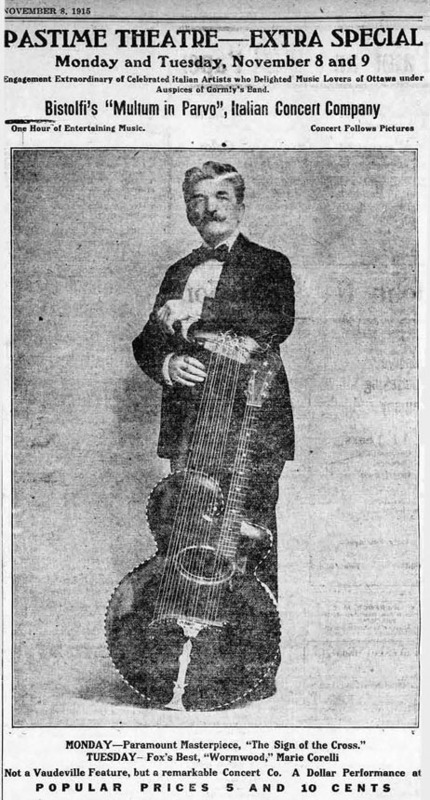 On this date, one Professor Joseph Bistolfi of New York was in Kalamazoo playing a harp guitar of unknown make in a duo with Louis Colombo on mandolin. The “reviewer” is describing the duo’s third performance in town that day in the Gazette’s editorial rooms after playing in a local auditorium and S. A. (?) Gibson’s studio, where he placed an order for “one of his famous harp guitars.” I have no idea where the “S. A. Gibson” could have come from. 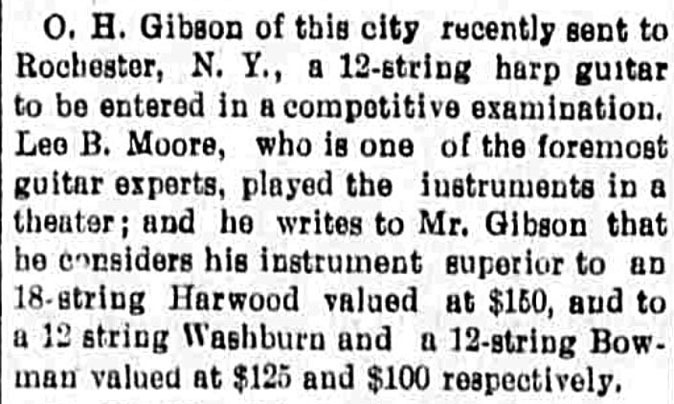 Regardless, in 1900 the Gazette newsman seems to be hip not only to Orville’s instruments but to his already “famous harp guitars.” Clearly he’d built a few by this time. Exactly one year later, we get an actual tally. Bistolfi’s now-completed instrument was apparently harp guitar number 8 (Note that we’re still a year away from the formation of the Gibson Co.). What type it was, we don’t actually know, since there were two very different designs from Orville around this time – the zither-style sub-basses floor-stander and the soon-to-be Gibson Co. catalog instruments (the roughly similar U and R). My gut tells me these were all versions of the latter two, though the article’s mention of “similar in construction” doesn’t denote similar design – so they could have been a mix, and Bistolfi’s could have been anything. 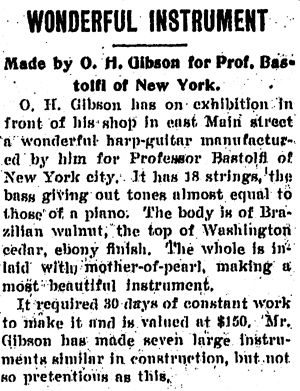 The notice tells us that Orville has finished Bistolfi’s harp guitar and has it on display “in front of his shop in east Main street.” Trying to envision this scene I learned from Walter Carter’s Gibson book that the shop was actually on the second floor of 314 East Main. Perhaps Orville had it displayed in an upper window, or maybe one had to traverse the stairs, knock on the door, and find it prominently displayed in his front studio? I have no idea how this might have been laid out, but these articles describe both a “studio” and a “shop” and I’m dying for a better “mind’s eye” glimpse, aren’t you?! It is described as having a Brazilian walnut body and Washington cedar top with ebony finish (so it couldn’t have been the extant red-top floor-stander at Gibson…assuming that’s its original finish). The instrument “required 30 days of constant work” and the “whole is inlaid with mother-of-pearl” – cryptic words indeed! They could be describing Orville’s pearl and ebony rope binding and/or an ornately inlaid fretboard. 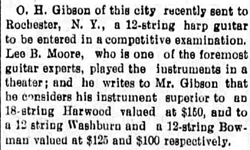 I’m inclined to believe the latter – however, being “valued at $150” seems much too inexpensive for all that pearl work, especially in light of those 1898 harp guitar retail figures above. Before finishing Bistolfi’s, Orville had made “seven large instruments similar in construction, but not so pretentious.” Again, to me “pretentious” implies something like the incredible fretboard “bling” of the red floor-stander, not simply rope binding and a couple fancy fret markers. It’s definitely a puzzle…thoughts, anyone? 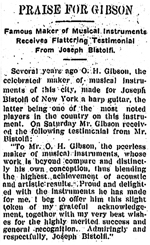 In 1906, Bistolfi sent Orville Gibson – not the new three-year-old company, but the originator – a glowing testimonial, reprinted in the Gazette. 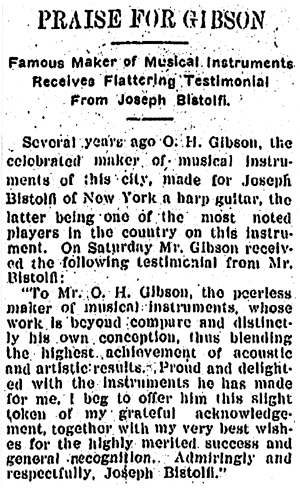 This would seem to imply that he was still playing the original 1901 Orville harp guitar, but it’s not fully clear as Bistolfi mentions “the instruments he has made for me” (italics mine). Perhaps there was a second harp guitar? Nice! 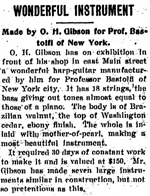 In 1915, we finally see an image of Bistolfi with a beautiful early Gibson harp guitar. But what is it? Is it the original 1901 Orville-built instrument? A second one built by Orville a few years later, with the new Gibson Co. label? Or a second one built by the new factory with Orville in his role of consultant? Expert Benoit Meulle-Stef and I wondered if it could have been an Orville creation, and we brainstormed for some time about it. Its unique features are subtle, but it remains a strange chimera of a Gibson harp guitar. Even now, this whole era remains something of a mystery, especially in regards to harp guitars, which seem to defy any linear design changes or catalog-matching. It likely has the standard 21” wide body, from which Ben and I calculated the scale length, ending up somewhere between the original 27-1/4” long scale and the subsequent 25-5/8”(temporary) standard. It’s hard to judge how much it might be tilted and influencing perspective. It has twelve sub-basses (phased out after about 1905) which appear to be arranged in the later 3×4 angled pattern (the 1903 catalog specimen was 2×6). There seems to be an extra wood block under the sub-bass nut (string damper?). Ben immediately spotted the strange string spacing at the bridge; the two nearly parallel banks are separated by a gap of a full inch – the only one like this ever seen (all others have the first sub-bass equidistant from the neck E at the saddle). Bistolfi must have had an unusual playing style – I can’t imagine any professional harp guitarist wanting to increase the stretch! This gap also requires the bridge to be a similar extra inch wider before it makes its curve down on the bass end. The metal strap looks standard, with “Gibson” probably engraved at the bottom. Both Ben and I think we can see the early Orville bulge where the neck joins the body on the treble side (look at the rope binding pattern), but I’m simply not sure. The fret-to-body joint is tricky also (see my blog on comparing the different scale Gibsons). The fingerboard inlay looks like it could be the typical “fancy” mix they did during the first several years of U harp guitars. The head inlay is very puzzling. Certainly that’s a star, but it’s a bit larger than usual and where’s the crescent? (The crescent could appear on either side as seen in different examples). It almost looks like there’s a recessed carved line near the top edge; if so, it doesn’t match the original carved headstock scroll. What’s also interesting is that I can’t seem to see geared tuners; these must have then been the early friction tuners. Our final Orville clue is the rope binding, an obvious Orville feature that wouldn’t last too long on Gibson Co. instruments. All these features noted so far could point to an Orville instrument, until we get to the soundhole. It is the standard smaller oval hole that the company switched to almost immediately. I don’t know that I’ve seen any Orville guitar or harp guitar with soundhole-to-body waist proportions like this. Rope binding in combination with a small soundhole is rare and has been seen (by Ben and myself) in just three specimens – all of which we circa date to 1904. For now, that’s where I’d put this instrument, which may or may not have been a second custom harp guitar built by Orville three years later at the direct request of Bistolfi, but under the new Gibson Company’s label. Your guess is as good as mine! 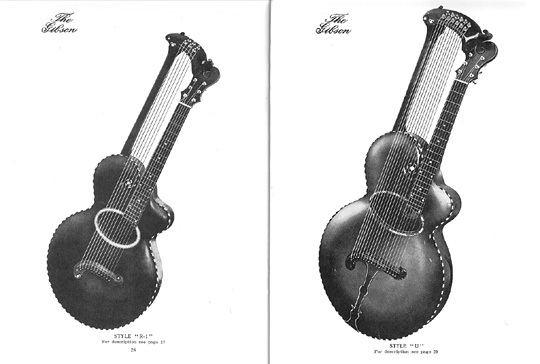 Bistolfi’s pictured harp guitar (on right) compared with the original 1903 catalog U 2×6 12-bass, large soundhole and presumed long scale and #2502 3×4 12-bass, large soundhole and long scale (bodies proportioned to roughly match). I think Gibson Harp guitars are the most beautiful guitars ever built. I love my Model R. I just finished building a Style O artist 6 string..the 2nd most beautiful guitar ever built IMHO. I am fascinated as to how musicians viewed these instruments and the role they must have played in early stringed instrument ensembles. I have viewed the Eddie Lang clip on Youtube. Does anyone know of any other old clips? Man, I love those monsters! Great brainstorming too! Gregg has done an outstanding job deciphering all of this recently uncovered information about Orville Gibson. From what I’ve seen, Orville built far more instruments than anyone previously thought he did. The one thing I find really fascinating about Orville is he NEVER made any two instruments alike. He created individual works of art with a wide variety of design features and wonderful ornamentation. All of this during the stoic Victorian era, when wildly exotic was not the norm and in fact, was frowned upon. O.H. was truly a trail-blazer. Gregg, the work you have done here is nothing short of amazing. What a fantastic article, I’m just blown away! Thanks so much Gregg.